Central Ireland, and the County Kilkenny, is where you will find Kilkenny Castle. To get to the castle in Leinster Province, driving is your best bet. It's just 90 minutes by car from Dublin Airport. Head south from the airport onto the M9, and stay on that road until you see signs for Exit 8. Head to the center of Kilkenny via Castle Road, and the thoroughfare called The Parade will lead you to the castle itself. Found in County Kilkenny, the aptly named castle was built by the 1st Earl of Pembroke, and it served primarily as a family residence until the middle of the 20th century. 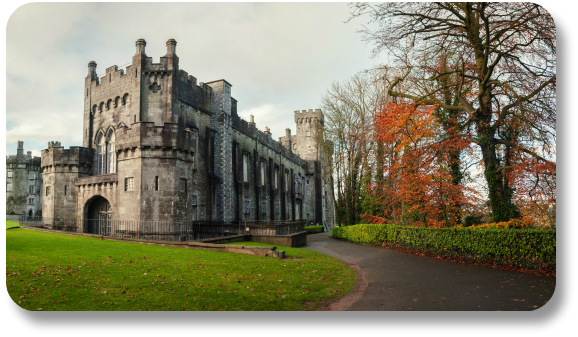 Now the Castle is owned by the city of Kilkenny, and visitors can picnic in the gardens, tour the interior of the castle and admire the art collection on display in the castle's gallery. The castle was erected in 1195 as a way to control the connecting waterways around the River Nore. The castle had a spectacular vantage point and would be better protected if it could see incoming ships. The 12th century stone castle that stands today at Kilkenny was probably not the first castle on the site. Just a few decades prior, a wooden castle was built in the same location by the 2nd Earl of Pembroke. For nearly 600 years, the Castle was the home of a powerful Irish family. The Butler family owned Kilkenny from 1360 all the way until the 1960s. The family is perhaps best known for dramatically withstanding a siege in the castle during the Irish Civil War in 1922. The family remained in their bedroom over the castle's gate while a machine gun was active right outside their door. In 1967, the 6th Marquess of Ormond, part of the Butler family, sold Kilkenny Castle to the people of Kilkenny. The sale price for the castle was a token £50. Since then, Kilkenny Castle has been managed by the Office of Public Works. Extensive renovation, archeological study and research are all ongoing at the castle. Kilkenny is open to the public daily. Start your visit in the Medieval Room, where a short video sums up the history of the castle. Another important room in the castle you don't want to miss is the Tea Room. It is housed within the original Victorian kitchen. If time permits, spend some time walking through the ornamental gardens. These are often overlooked, but they are beautiful and carefully manicured. The Castle is also home to an impressive collection of art and artifacts. Check out the Butler Gallery in the basement as well as key pieces on display from the National Art Gallery. You can find much more information about this important Irish landmark here.